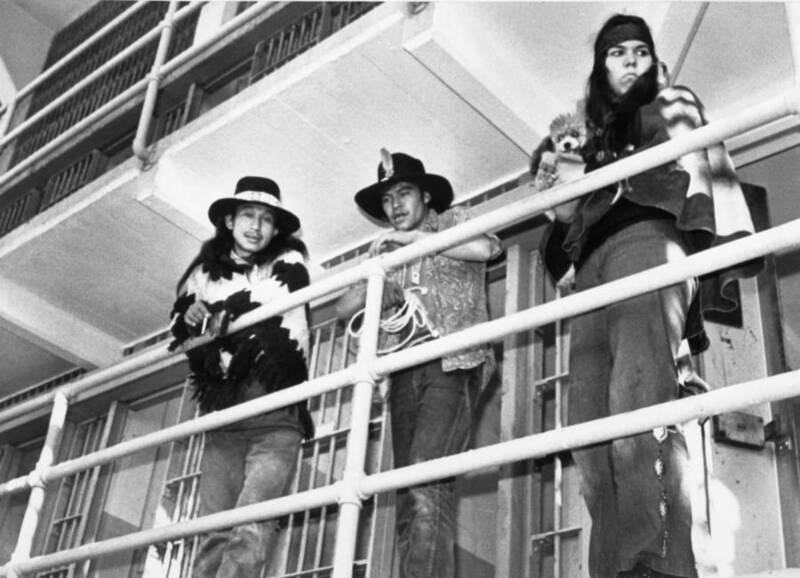 During the 1969-1971 occupation of Alcatraz, Native American demonstrators took control of the former prison in protest of government abuses. Bettmann/Contributor/Getty ImagesNative Americans stand inside the prison during the occupation. Alcatraz Island was home to America’s most infamous prison for about 100 years — first as a military prison, then as one for federal convicts — before closing its doors in 1963. But for a brief period beginning in 1969, Native American activists occupied the “The Rock” in protest of the U.S. government’s treatment of their people, particularly when it came to land rights. Furthermore, their stated goal was to turn the island into a Native American cultural center and school. When asked to leave during the initial occupation, those who took over the island sarcastically replied that they’d vacate in exchange for $24 in glass beads and red cloth, referring to the infamous “purchase” agreement for Manhattan Island between Native American and European settlers in 1626. Ralph Crane/The LIFE Picture Collection/Getty ImagesTim Williams, Chief of Klamath River Hurok Indians of California, addresses a crowd prior to the occupation of Alcatraz. During a similar attempt in 1964 that lasted just a few days, five members of the Dakota tribe ended up occupying the island in the name of their people, referring to the Treaty of Fort Laramie, which allowed Native Americans to appropriate surplus federal lands in the United States. Of course, like all such treaties, from the U. S. government’s point of view, they weren’t worth the paper they were written on. 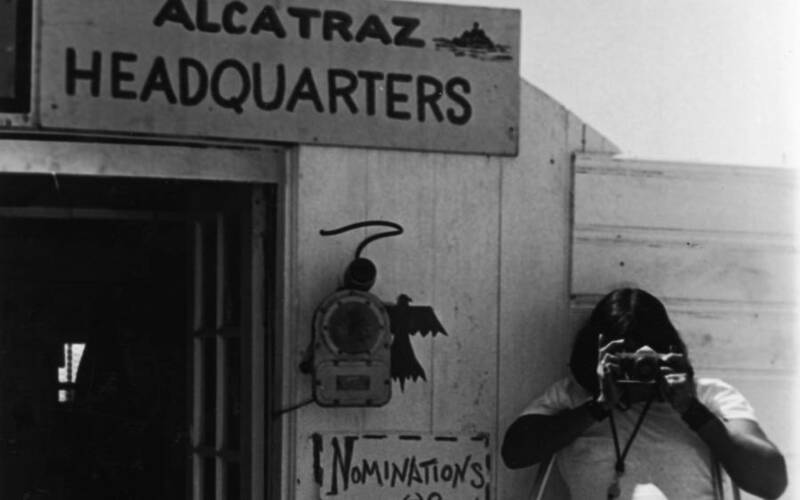 Hulton Archive/Getty ImagesA Native American man takes a photo during the occupation of Alcatraz. Eventually, just a few weeks later, 89 Native Americans from various tribes made it to the island, many of them members of the Red Power movement that sought civil rights for Native Americans starting in the 1960s. 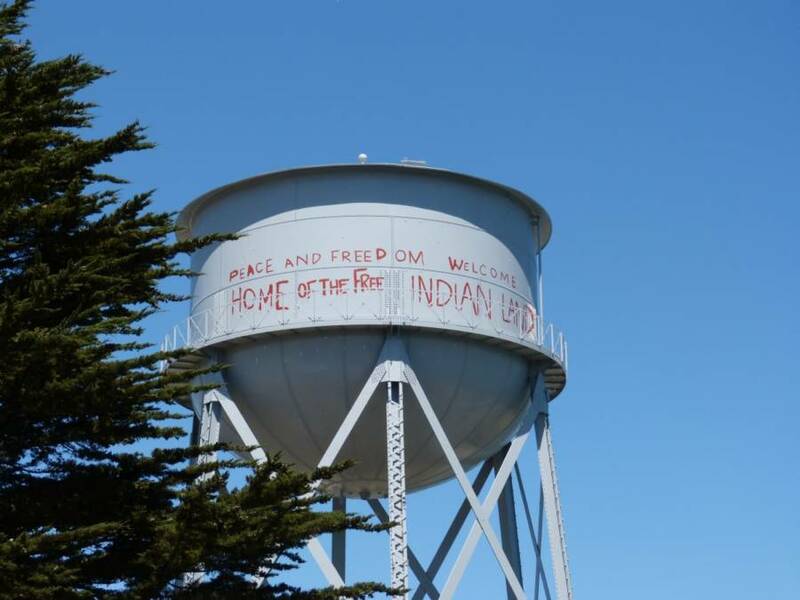 Very quickly, a message appeared on the island’s water tower, which read: “Peace and Freedom. Welcome. Home of the Free Indian Land,” while other slogans like “Custer had it coming” and “Red Power” were also painted in various places. Richard Oakes speaks to the press just after the occupation of Alcatraz began. 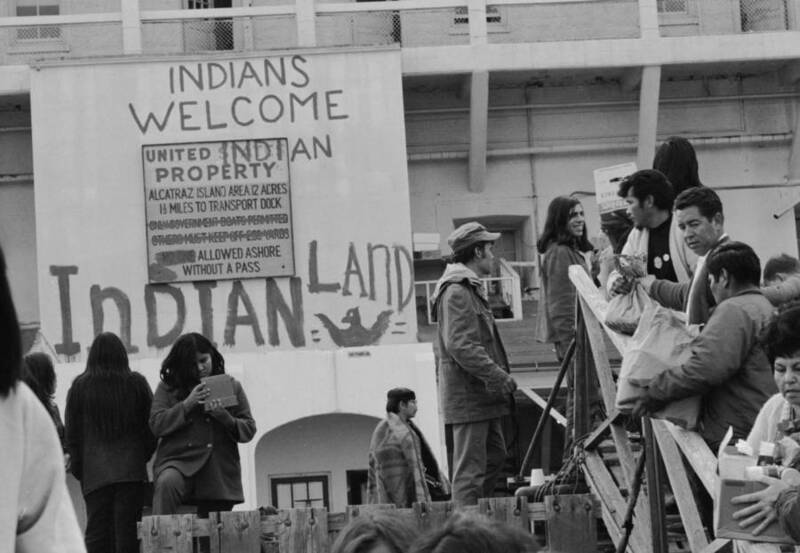 With the occupation of Alcatraz underway, the demonstrators first issued a proclamation (the one offering up the $24 in beads and red cloth), stating that they didn’t mind the lack of fresh water and the fact that the island was largely undeveloped because they’d been living in similar conditions on the reservations back on the mainland. The Nixon administration, unwilling to undergo the public spectacle of forcibly removing the Native Americans from the island as long as they were peaceful, sent representatives to negotiate, but the self-named “Indians of All Nations” refused anything except a deed to the island. Ralph Crane/The LIFE Picture Collection/Getty ImagesUnder an altered sign, Native Americans who had taken over Alcatraz island unload supplies from a boat. With activists, supporters, and others joining the original 89 demonstrators over the coming months, the population of the island soon swelled to more than 600. They set up kitchens, a health clinic, a public relations department, a nursery, and a grade school. 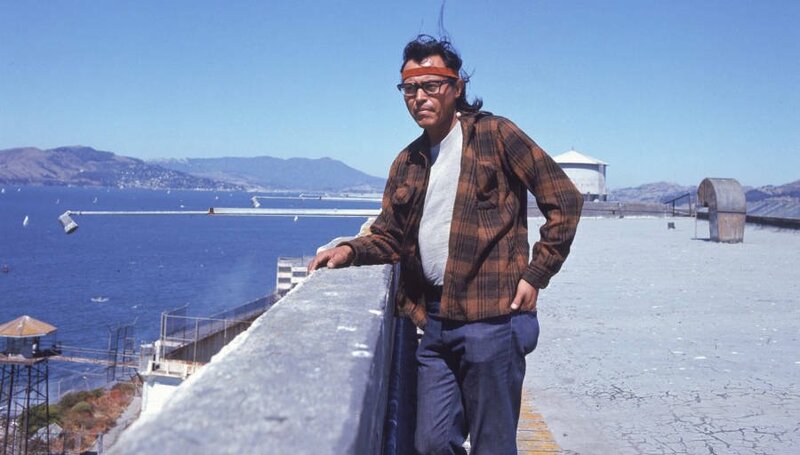 Hulton Archive/Getty ImagesDuring the occupation of Alcatraz, a Native American man stands on the roof of the prison. 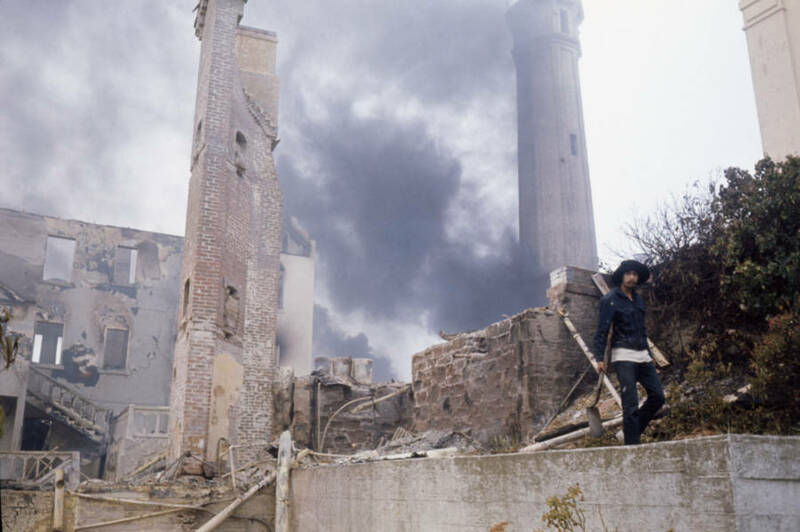 By the end of 1969, donations — including cash, clothes, and food — had arrived to bolster the occupation of Alcatraz, and celebrities visited the island in support, including Jane Fonda, Merv Griffin, and Anthony Quinn. At the same time, the U. S. government was plotting its way out of this predicament. Bettmann/Contributor/Getty ImagesParts of Alcatraz burn during the occupation. Tragedy struck when the main leader of the movement, Richard Oakes, and his wife lost their stepdaughter when she fell off a walkway on the island and died. Consumed with grief, they left the island soon after, and it all began to fall apart, with competing factions looking to fill the leadership vacuum. In May 1970, Nixon and his administration had concluded that no agreement could be reached, so they cut the power and Alcatraz fell into darkness. Just a few weeks later, a fire tore through several historic buildings; to this day, it’s not clear if it was an accident or the work of some outside provocateurs. 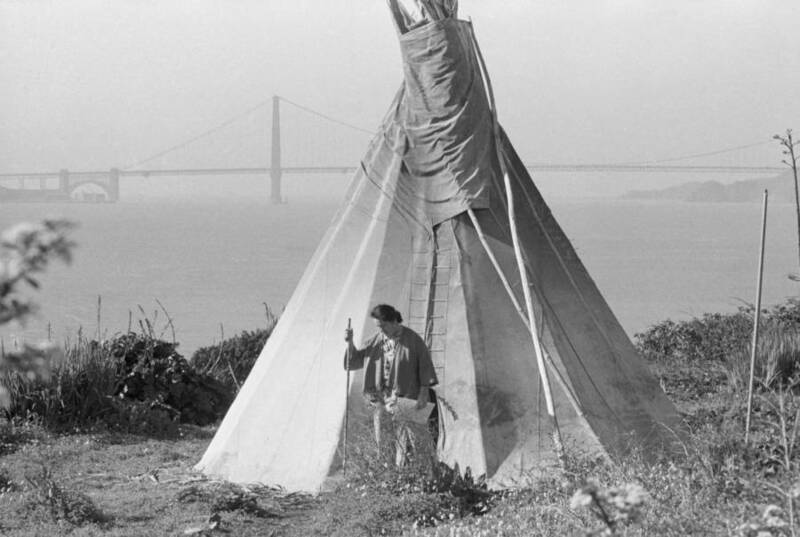 Bettmann/Contributor/Getty ImagesA man stands outside a tepee set up on Alcatraz during the occupation. Despite the fire and the blackout, some remained for almost another year, but conditions went downhill rapidly. Armed federal marshals removed the remaining handful of people in June 1971. 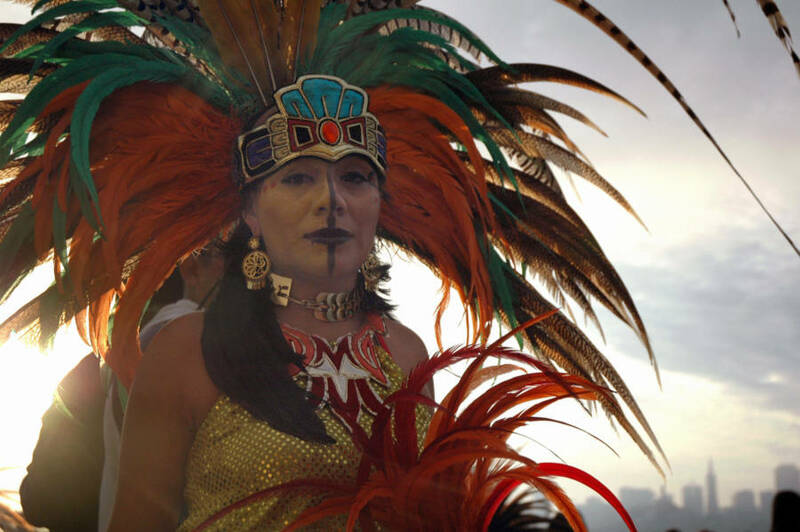 Kara Andrade/AFP/Getty ImagesA woman performs with the Teo Kali Aztec cultural group during an “Unthanksgiving Day” ceremony on Alcatraz Island in 2005. 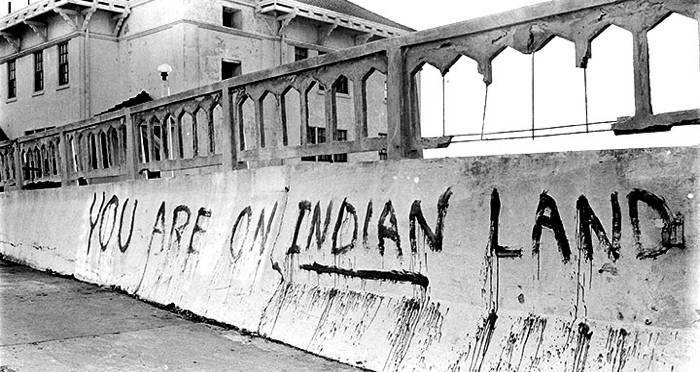 Alcatraz became a National Park in 1973, and some graffiti from the occupation remains today. Every year in late November, Native Americans and supporters gather on the island to declare an “Unthanksgiving Day” in support of Native American culture and heritage. In the immediate aftermath, however, the 19-month occupation brought attention to their plight, and eventually, forced the U. S. government to grant some self-determination for indigenous people, as well as return millions of acres of land to them. In addition, more than 50 legislative measures were passed supporting tribal self-rule. PixhereThe Alcatraz water tower, including a recreation of the text that had been written on it during the occupation of Alcatraz. The other legacy of the occupation, however, is the precedent for direct action by Native Americans against the U.S. government, which continues through today with the events at Standing Rock in 2017 and beyond. 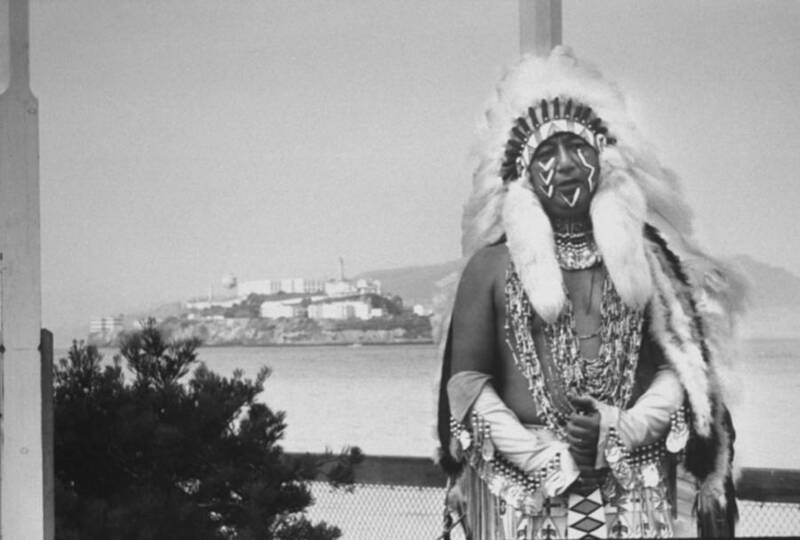 Without the occupation of Alcatraz, it’s possible that many of the later demonstrations that have informed modern Native American history would never have come to pass. Next, read what happened to the Dakota people of Minnesota after the Dakota Uprising of 1862. Then, see portraits of Native Americans captured before a lot of their people disappeared. Brandon Weber has been writing & creating viral joy on the Innerwebz for over 7 years at Upworthy, The Progressive, Big Think, and more. His book is available on Barnes & Noble.